Come and enjoy this fabulous townhouse right on the 7th hole of the Jack Nicklaus Golf Course. Enjoy spectacular Greens and Mountain views from the balcony equipped with barbecue grill. Located right next to the community pool and jacuzzi, this condo also comes with the use of a 2-seater golf cart for tooling around the peaceful and pristine community of PGA West. This townhouse will satisfy the most discerning traveler with its luxurious beds and bedding. There are two master bedrooms with king beds, one overlooking the golf course. The third bedroom offers two twin beds. The kitchen is equipped with enough cookware and bakeware to prepare a Thanksgiving feast! 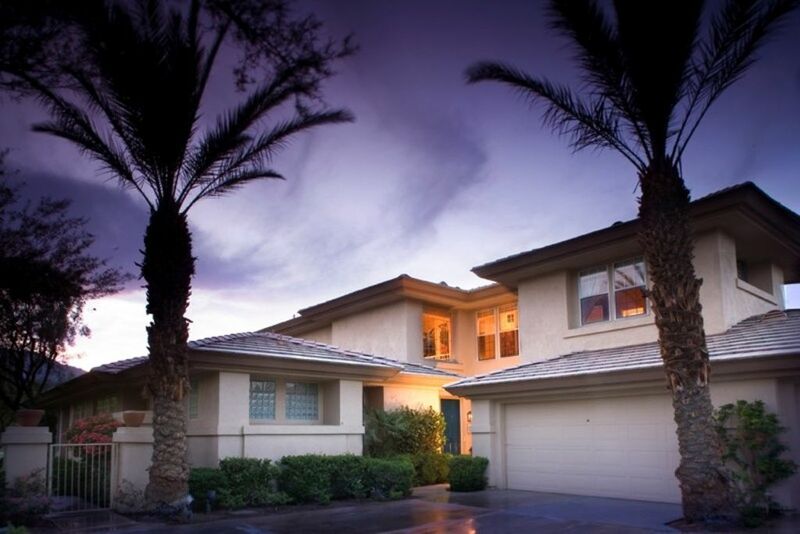 This professionally decorated 1700+ square foot PGA West luxury vacation home is an upstairs unit in the prestigious guard gated private country club community of PGA West. Mountain and Lake views are spectacular. Mountains are lighted at night for majestic ambiance that can be enjoyed from the balcony or pool/spa areas. This community is a golfer's dream! Three championship golf courses are available for public play, two clubhouses and restaurants. This beautiful villa is perfect for couples traveling together, absolutely ideal for a great family vacation, and a golf lover's dream! Washer, dryer and WiFi included. Maid service and/or grocery shopping can be scheduled for an additional fee. We pride ourselves in making your vacation carefree! PGA West is located 30 minutes from Palm Springs. Palm Desert's famous El Paseo, with it's elegant shopping, art galleries and fabulous restaurants are only 20 minutes away. PGA West is also the home of the Bob Hope Chrysler Classic. The Bob Hope Chrysler Classic Golf Tournament at the PGA West Palmer Course, the Dinah Shore Kraft Nabisco Golf Tournament, and the Pacific Life Open Tennis are all within 5 to 15 minutes. PGA West includes six world class golf courses, three of which are available to PGA West guests. The relaxing pool is just steps away. Overlooking the 7th hole of the Jack Nicklaus course, with a view of the mountains which are backlit in the evening. Pool towels and pool accessories available. Easy check in and check out! Condo had everything we needed and more! Management was a breeze to work with. Golf cart is an added bonus! We loved our stay and would stay again for sure! Great place located next to pool / spa and on the course. Well maintained and prompt response from owner when needed. Will return!!! Excellent property. Clean and spacious. Close to all activities at PGA West. Loved the unit, but would recommend that the owner provide bath soap. We had a wonderful experience staying at this condo. Everything was either brand new or like brand new and all appliances etc. were top of the line. We felt like we were at home and wished we had longer to stay. The view on the patio is beautiful with golf course and mountain views. I would highly recommend this condominium to anyone and have already started talking to our friends about it. We would definitely go back to this condo next time we go to Palm Springs. The condo was very clean, comfortable and quite up to date. We would definitely recommend this property and hope to rent it again in the future. PGA West is a spectacular master-planned and semi-private country club community at the base of the Santa Rosa Mountains in beautiful La Quinta, just 30 minutes from Palm Springs. Three semi-private golf courses and two clubhouses are available to guests of PGA West during their stay. The nearby La Quinta Resort & Club offers two additional courses, and is home to the Jim McLean Golf School (the leading golf school in America). Guests can also enjoy a world-class tennis experience at the resort’s state-of-the-art facility under the leadership of Director of Tennis,Tom Gorman (America’s most successful Davis Cup captain and coach). The resort’s spa has been recognized as one of the top spas in the country, and the dining options are excellent. Southern California’s ultimate tennis destination, Indian Wells Tennis Garden is home to the annual BNP Paribas Open, one of the most prestigious men’s and women’s tennis events in the world. The Indian Wells Tennis Garden is an 80-acre tennis and entertainment facility, with a year-round world-class tennis club and a 16,000 seat stadium showcasing the world’s most elite players, and hosting a wide variety of special events such as festivals and concerts.